Everyone I have talked to knows when it comes to sending money home from overseas, banks are gonna take a piece of your hard earned cash. Although these small pieces add up, interestingly, no one seems to know the best way (cheapest) to get the better part of their money home. 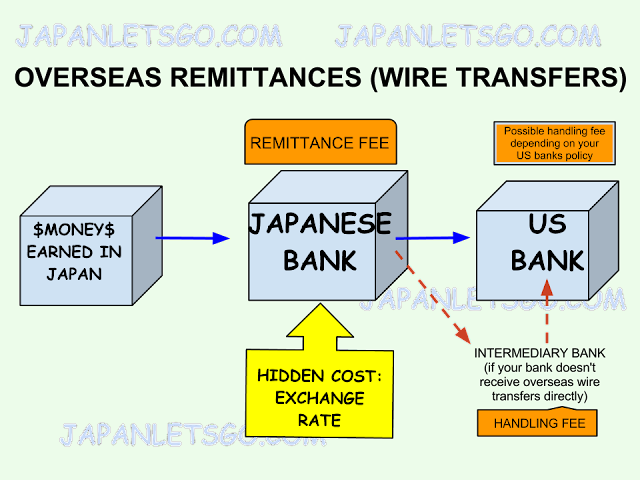 I will break down the process of what happens to your money when it leaves your bank, why it decreases once it gets to the other side, and finally, give you the tools necessary to decide for yourself what the best way is to transfer your money from Japan (or any country for that matter) to the US via wire transfer. Money goes to the Japanese bank goes to the US bank. Simple enough. 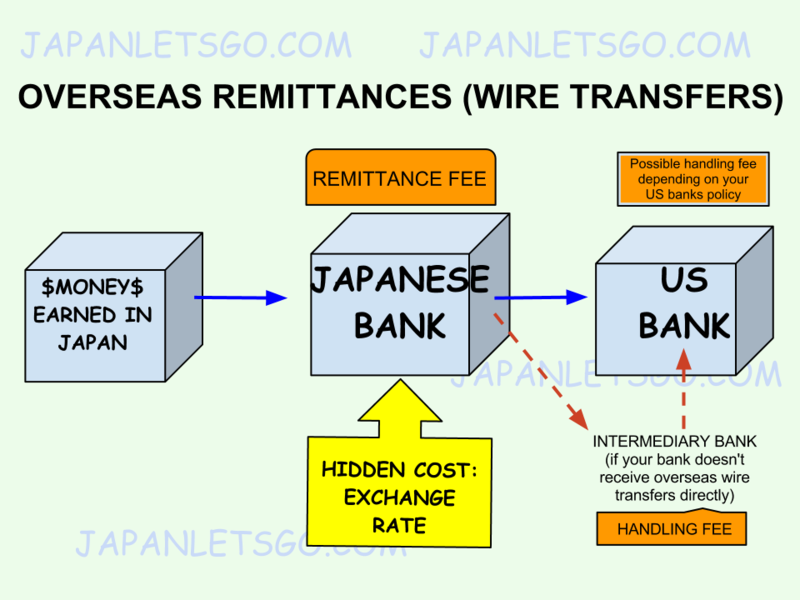 Remittance fees (cost of the wire transfer) are standard and can't be avoided. But depending on which bank you choose, you can save. Here are the going Remittance fee rates for a few of the popular banks, three of which I personally have accounts with (first 3 on the list). Anything less than around 100,000 yen and you will probably want to check out the American Express Travelers Check service found at the Japan Post Office (Japanese only) which charges 2% of the amount you choose to send. Then just mail it to your bank in the states, tell them to deposit it into your US account, and you can avoid handling charges associated with overseas remittances. You could also check out Western Union but I haven't looked into it at all but its connection to Seven Bank (Seven Eleven) may mean greater availability. This is all pretty standard and basically you work with what you have up to this point. a bank can hide its cheap remittance rate behind a bad exchange rate. Banks have the standard exchange rate and offer their customers something lower. Essentially the bank could make a profit on your transfer. 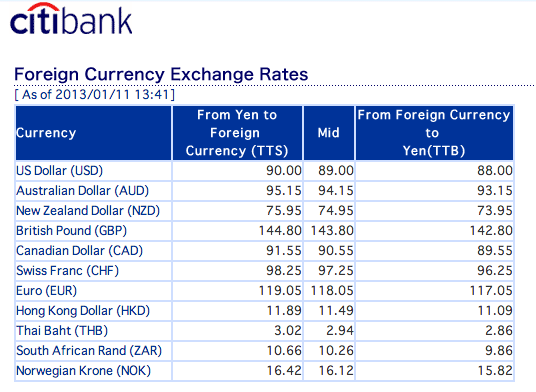 For example the marketing is selling a dollar for 93 yen, the bank offers you 91 yen per dollar. They can essentially make 2 yen on every dollar deposited into your US bank account. 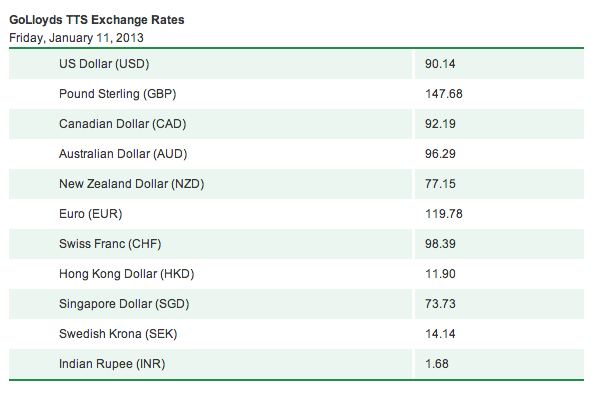 But at first glance, the offered exchange rate is hard to understand. * I focus on sending money from JAPAN to the US, this means work with the posted TTS Exchange Rate. You can very easily calculate with the TTS rate how much you should receive in the target currency (US$). I will include the calculation here: I want to send 250,000 yen using the TTS rate of 90.00 using Citibank. Divide the remainder by the TTS rate. 246,000/ 90.00 TTS= $2,733.33. This is the final amount I receive in my US bank account (if it is sent directly without any additional fees). Looks like with GoLloyd's I can get an extra $17.95 (2,751.28-2,733.33=17.95) and in these topsy-turvy economic days every little bit helps especially if you have to do this every month to pay student loans, as I do. The banks update their posted rates every few hours on their websites, and somedays depending on the hour, you may be able to get a better exchange rate from one bank than another. Thus, in an ideal world you would want to take a sample of data points to compare and see which bank routinely provides the best exchange rate over an extended period of time. But really, who was time for all that noise? especially when you need to get that money home fast. The bank that routinely comes out on top, month after month, is GoLloyds. possibility of upgrading your bank account to access the bank's premier exchange rate. It is only my goal to shed some light on a topic I personally found to be a bit murky when I first settled down in Japan. And I realize that in some cases we are taking about the difference of saving a few bucks. I know it isn't much. But it does add up. And I for one just like knowing whats happening with my money. If you have some info or a personal experience to share about banking in Japan or transferring money home COMMENTS WELCOME. Thanks for reading. thanks for sharing. i got lot information from your site. Now that go llyods is taken over by shinsei, I guess shinsei is now a GIANT in the business. Currently waiting for my citibank application. Then yen is running faster than Usain Bolt. Thanks very much for putting this all together in an easy to understand manner. Now I got my head a bit clear. This will be very helpful as I send money overseas often. Thanks again! Hi..thank for your info...its knowledgeable. ..i need your contact for further discussion for transferring money from japan. How about solutions like Transferwise or Paysera? Their fees are much lower than bank fees and they advertise no hidden charges. I haven't used them yet, but I am curious and willing to try in the future.